Perils for Pedestrians. Episode 86. A bill to make walking the official state exercise of Maryland is vetoed by Governor Ehrlich in Annapolis. The Rails to Trails Conservancy hosts a conference in Providence, RI. Project for Public Spaces meets in New York City. In Brooklyn, the Honku Poet has an antidote to road rage. The TMA Group and Transportation Management in Franklin, TN. 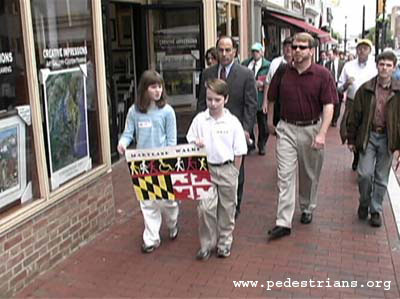 Students from Montgomery County, Maryland, went to Annapolis to celebrate the passage of the bill they promoted to establish walking as the official state exercise for Maryland. Their celebration turned into a protest march when Governor Ehrlich inexplicably decided to veto the bill.